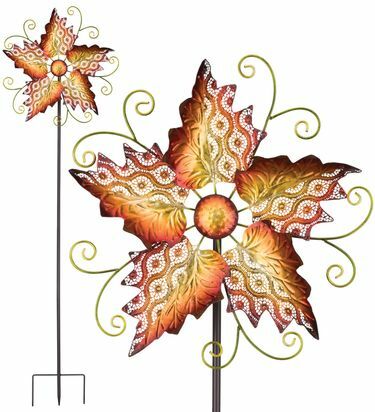 Our wonderful new lace-cut leaves wind spinners combine intricate design with motion and metallic colors to create a dazzling effect as they spin in the wind! With blades that spin easily on ball bearings you'll enjoy movement and fun even in the slightest breeze. A sturdy 3-pronged fork at the bottom of the stake adds lasting stability and strength. Sold only in pairs of two and available in either maple or green colors. Place one on each side of the yard, or gift one to your best friend! Size: 18.5"W x 62.5"H each, Metal.